1. The clips were completely out of context. We don’t know what incident required police response and what led to the police using force. The bottom line is, if you’re being detained by the police and they ask you to do something, well, you better friggin do it. LEOs can’t always know or trust what someone is going to do, so if an officer tells you to sit and you decide to stand up, that is taken as a threat. Any LEO will tell you that their own safety is number one. Our hard working LEOs deserve to come home safely to their families every night. 2. If any of those videos demonstrated unnecessary or excessive use of force, that’s very, very sad, but it’s unfair to lump all LEOs together and assume that’s the way all police officers behave. I am ashamed of any police officer who would abuse his or her power, but as with anything in life, there are bad apples out there. None – NONE – of the police officers I know would hurt someone for no reason. I only got though half of the video before I closed it out. I debated commenting on the post, defending the honor of our LEOs but decided against it. The last thing I needed was to start a Facebook argument… especially when it’s nearly impossible to change someone’s opinion. So I moved on, but over the last week, the post kept popping into my head. While dealing with the hatred of police is nothing new, this one, for whatever reason, really stung. Maybe because the post was so brazen, something posted by someone I know personally and not just Joe Schmo commenting on a news article. But I think what bothers me most is the sweeping generalization that all LEOs behave a certain way and the assumptions that all of the acts in the video were malicious. There will always be plenty of people who hate the police- that’s just the nature of that type of work. But when your husband, your best friend, the father of your child, your LIFE, is the one out there putting his life on the line, it’s hard not to take that stuff personally sometimes. What I wish is that the hateful people out there will have some kind of encounter with the police that will show them the true heart that beats within most of our LEOs, because I want everyone to see for themselves the beauty in each of them. 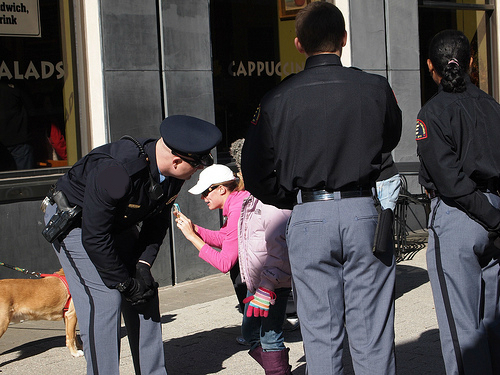 Not the best angle, but this was taken by a citizen as JD helped a little girl who got lost during a parade. This is the video montage I want to see. This entry was posted in LEO Life, Married Life, Mom Life and tagged JD, LEO, LEOW, Police, Police Wife. Bookmark the permalink. I agree with you 100% My brother was a LEO plus I have always felt like many people don’t appreciate LEOs and I also believe that there are too many laws that restrict LEOs from doing their jobs, after all, they ARE putting their lives at RISK to help our communities!!!! I read a story a couple of months ago about a woman who was stealing food from a store so the cops were called. The policewoman who showed up apparently didn’t arrest her, and bought the food for her instead because she had hungry kids at home. I thought that was really sweet. Thanks for sharing 🙂 These are the stories I want to see! There are plenty out there. We just don’t hear about them.